Mom’s Tomten sweater with a tree of life from Barbara Walker – root system by me. I have always been a teach-an-individual-to-fish kind of person. In my knitting circles I recently witnessed a brouhaha over reverse engineering a knitted garment and whether to share the process notes. It got me thinking about the value of shared knowledge. What am I willing to figure out? What would I just as soon pay for? What am I willing to share? Under what circumstances am I needing to be paid for my work? First, I came of digital age when Open Source was called GNU. Anyone could tweak or add to commonly available applications; the least buggy, most useful versions would persist. Entry into the process was open to anyone, but improvements happened slowly, as needed, by people willing to innovate. Second, I am a big fan of Ursula K. LeGuin’s “The Disposessed,” a novel about a working communal society. Figuring out how to use a new technique is a lot more fun than figuring out the technique itself. 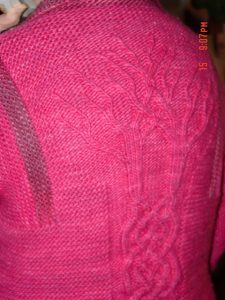 I am more likely to read about grafting one knit piece to another, and then apply that knowledge to the next sweater, scarf, or shawl I make. I use sequences and series from color theory or beginning calculus to inform how I merge Fair Isle and Shetland lace motifs. Origami and geometric shapes also appear in how I structure sweaters. Fractals and flow transformation come into play as one shape or pattern morphs into another. I might start off with little diamonds which gradually elongate to become leaves. Leaves broaden to become waves. I try out an effect first with lace, then add color, then add traveling twisted stitches to become brioche. The story is often the same rocky Maine coast, but the presentation is eternally different. This, for me, is play. When I can’t figure out the How of something, I will pay for a pattern. I rarely make the item I paid for, mining it, instead, for information. I wanted to knit an afghan modeled after the Drunkard’s Path Quilt but couldn’t figure out how to embed a quarter circle in a square. I came upon a blanket made of knit squares that contained circles of color and bought the pattern for that and borrowed that strategy. 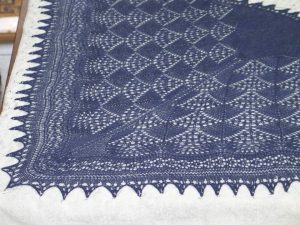 Other times it has been more hype than usefulness as I found when the asymmetrical garter stitch shawls started to become popular. It was as I had suspected a matter of increasing on one side every row, and decreasing every second row on the other side. There it turned out the information worth buying was the percentage of yarn you needed to reserve for the bind off. I try to pay forward what I’ve gotten. I give away a lot: shawls, hats, baby sweaters, and advice. I give to people who need the comfort of an unexpected gift, a virtual hug. I give knowing the gift has value because and the receiver couldn’t or wouldn’t make the thing for themselves. I use the baby sweaters and hats to try out new designs; they are often prototypes. I give a shawl to each graduating niece, in the color of their choice and the fiber of mine, with or without beads. I give the nephews cook books. I charge for what gives me stress – if too many people are involved, or there is nothing left to tweak or learn, or there is a deadline. I knit my sister an entrelac sock for Christmas. I figured the second sock would take me at least another six hours of knitting those tiny squares, and couldn’t quite bring myself to do it. For the second sock I used the same yarn and a different pattern that focused on short rows instead. Recently she asked what it would cost a friend to have me knit a pair, both in entrelac. Twelve hours, I said. Then $120, she said. I haven’t heard back. If the friend lived nearby, I would happily coach her for free if she wanted to knit her own pair, but to knit them myself, again, I would need the incentive of money. People will say that isn’t the way to sell things; the market won’t bear the cost. True. That doesn’t bother me. Happily, I don’t need to make a living. But think about what cart wranglers at the grocery store make. Each September I sit with other Wednesday Spinners at the Common Ground Fair and teach people to use a drop spindle. It is my weekend to share an important part of my craft, and work with others to better appreciate the joy fiber arts can bring. I meet each learner on their own terms. With some it is just learning to spin the spindle and draft the wool to make a rough sort of yarn. With others it is chatting about the structure of each hair and the physics of spinning. I work with all ages of folk from 4 to 80 on up. I have a blast. I was taught to spin by a woman who felt it was an essential bit of knowledge for everyone. I am compelled to pass that on. The same feeling of outreach applies to knitting. But if I have to prepare a special presentation, balance a class with a variety of skill levels, teach an agreed upon set of skills in a specific period of time, then it becomes a job. I still enjoy the class, but the preparation that allows me to have fun is the work and I want compensation for that. It turns out I am delighted to share my time or knowledge with anyone, as long as I can manage the schedule myself. I’ll coach you along your journey in person, email, or skype. If you’re having a baby, I’ll give you a one-of-a-kind sweater or hat. All else arrives serendipity, with maybe a touch of kismet thrown in. I am a writer, fiber artist, and occasional raconteur. I've been around the block a time or two, but stuck to any career I ever had for at least 10 years. They have all morphed logically from one to another. But under it all I have eternally been a teacher and a learner. I think you have a great way of looking at the give and take. I do give a lot of my “work” away, but occasionally do get paid. My goal is to help feed the sheep, but I volunteer my time and see it as part of what I need to keep me healthy. I receive even when I am giving something away.